By 2025, 10% of all households across the world will include enough technology to be considered smart homes, a recent market research report has forecast. When excluding large ticket items, such as major appliances, the global market size for smart home devices is forecast to be worth $3.3 billion by the end of 2017, reaching $9.4 billion in 2021. Although the EMEA and Americas regions are expected to represent more than 70% of revenues for smart devices over the next five years, Asia is expected to dominate in terms of unit shipments. In 2021, the Asia region is expected to represent about 46% of unit shipments. Leading the unit shipments in Asia in 2021 will include light bulbs, air quality sensors and video cameras. The top smart home devices to watch in terms of unit shipment growth, include radiator valves, air quality sensors, smart speakers and appliances. 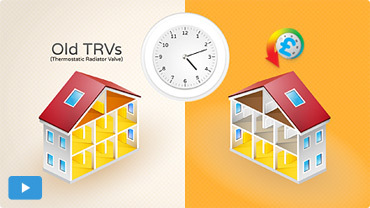 Savings of up to 30% on average energy bills can be achieved when using the HeatSave wireless thermostatic radiator valves together with the HeatingSave Building Management Systems (BMS), thereby optimizing energy consumption across your smart home. The HeatSave wireless thermostatic valves represent a very good solution for any household. That’s because the TRVs can help customers slash their energy bills by allowing them to thoroughly control the heating patterns for every single one of their radiators.